Urifunnel Portable Urinal Funnel for Men Converts Toilet into Urinal (Medium) by Urifunnel at Franklin County Cancer. MPN: URI-MED. Hurry! Limited time offer. Offer valid only while supplies last. The Urifunnel is an award winning simple portable funnel device that is designed to convert an ordinary commode into a urinal for males of all ages. The Urifunnel is an award winning simple portable funnel device that is designed to convert an ordinary commode into a urinal for males of all ages. Its patented design is a cost-effective alternative to maintaining a clean, hygienic & safe restroom. It was created by a family who has a son with special needs where toileting was especially an issue but found there were multiple markets who could benefit. 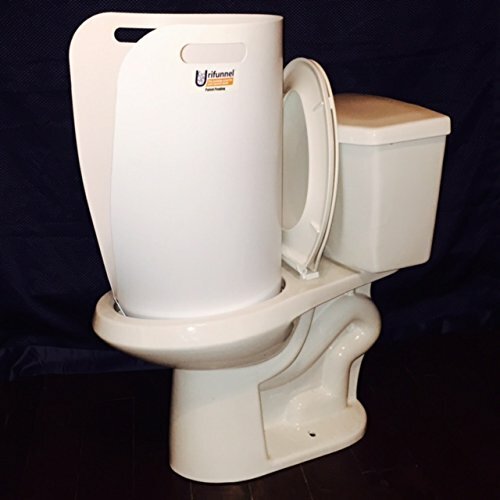 The Urifunnel is useful for any male that wishes to promote hygiene, dignity, and independence while using the bathroom. This includes children who are potty-training, males with special needs, and elderly males. It is a great device that will drastically reduce the amount of cleaning in the bathroom and enhance the lives of the patient and their families. The Urifunnel is used to maintain a clean, safe & hygienic bathroom. Medium Size is 28" tall and is used for any average size person. It is made from a medical grade plastic that is durable, lightweight & waterproof. Drastically reduces the amount of splatter on toilets and surrounding areas. It promotes independence, dignity & and confidence while using the bathroom. If you have any questions about this product by Urifunnel, contact us by completing and submitting the form below. If you are looking for a specif part number, please include it with your message.